A few months ago I saw a quilt on Pinterest. It was a very happy, bright, starry quilt by Leslie Unfinished. Naturally, I pinned it to my board of "To be Made" quilts. 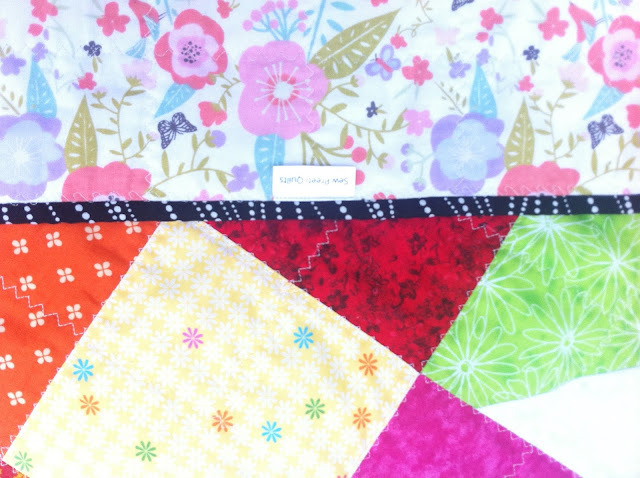 Once I finished Homeful, which was a production, I wanted a quilt that could go quickly from fabric selection to a finished quilt. Meet Jewel Star. This is just the kind of weekend project that can perk up any child's room. I wanted bright colors. I purposely avoided blue. Why? I am not sure. 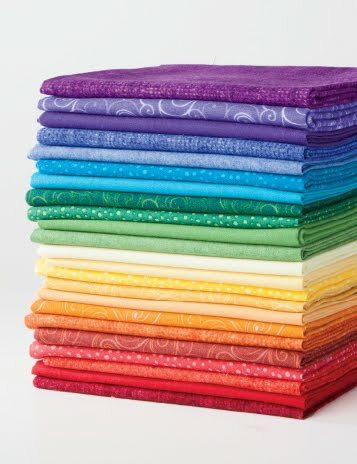 I just was thinking of a girl quilt. I love the idea of the stars peeping out of the negative space. 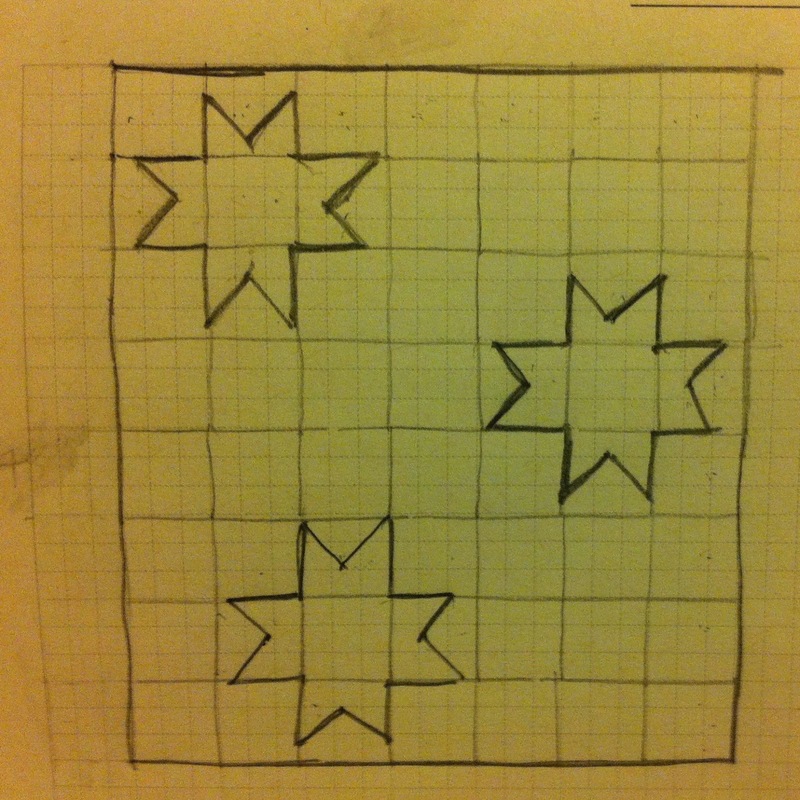 I decided to go with three stars, randomly distributed in the quilt. Here is the problem with random - it needs to be planned otherwise there is a danger that it may look too uniform. I know it sounds counter intuitive. In any case, I decided to sketch it out first. This way I could decide the size and the number of the blocks too, in addition their placement. This pattern is charm square friendly. 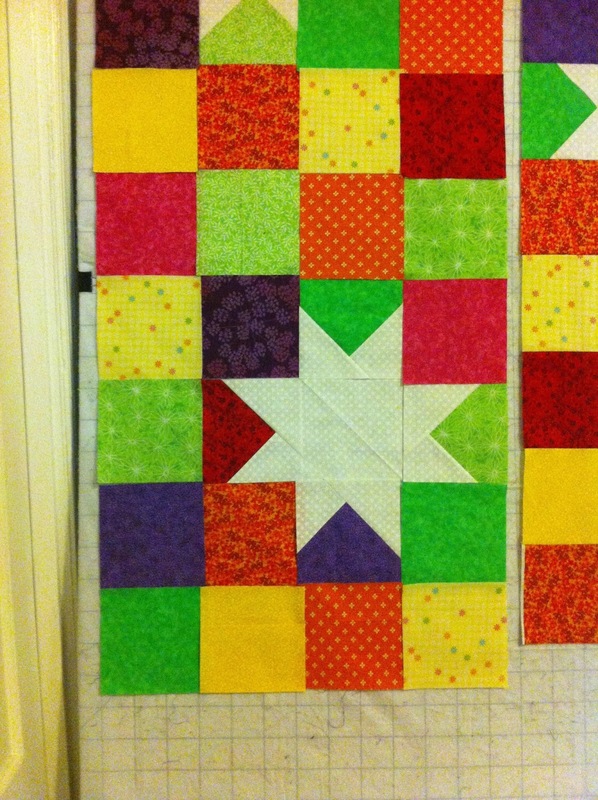 Since I was cutting yardage and using scraps, I chose a 6" block. Paul: Who is that for? Me: Dunno. Just need to make something. Me: Yes. Crazy about you. Paul: Nah, just plain crazy. Me: And very busy. Leave me alone!!! 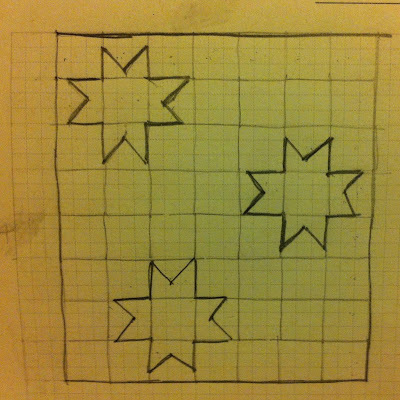 The blocks/squares are arranged 7 by 9 for a total of 63 squares. When the quilt top was complete, I admired it again and again. And then received an invite for a staff meeting at work...followed by a Sprinkle for a co-worker. Let's call her Julie (not her real name). 1. It was Julie's third baby. 2. No, she is not registered anywhere...because she has most of the baby stuff already. 3. It is a girl. Very quickly, all the dots in my brain connected. Jewel Stars for Julie's baby girl. Perfect. I struggled with the backing. Since the top is so bright, I wanted something bright to match those jewel tones. However, the muted colors in the backing left me stumped. Finally, I chose a black with white wavy dots and I am so happy with it that I have decided to replenish that fabric so that I can make many more bindings out of that fabric!!! Don't you just love it when the binding works for both sides of the quilt? I took a few more pictures in the morning, before I left for the staff meeting/Sprinkle. I am convinced that morning light is the best for taking pictures. The colors look so saturated. The finished quilt measures 42 by 54, making it a generous baby quilt or a crib quilt. Those babies - they grow up so fast. Here is hoping that the generous size would ensure that the quilt is usable for a bit longer. And there is one more thing about this quilt that makes it a bit more special. A label which is "oh so professional." Do you like it? I found them on Lorna's Sew Fresh Quilts blog. Here is the link. On the other side are care instructions. When Julie pulled out the quilt from the gift bag, her face glowed. "My girl has a lot of hand-me-downs and there is nothing wrong with that. But this will be her very own quilt. " And that was the sweetest thing I heard. It is ridiculous that the first baby is welcomed with a shower and the second and third ones just get a sprinkle. I am sure that by the time it is Baby # 5, the celebration would be reduced to a Raindrop!!! I believe that every baby should be celebrated, whether they are first or not. I hope this quilt is that celebration for Julie's baby girl! Others oohed and aahed, took pictures, and complimented me on my beautiful work and thoughtful gift. Mission Accomplished. Julie is due next month and I am looking forward to meeting her new bundle of joy. This is my 12th finish of this year. 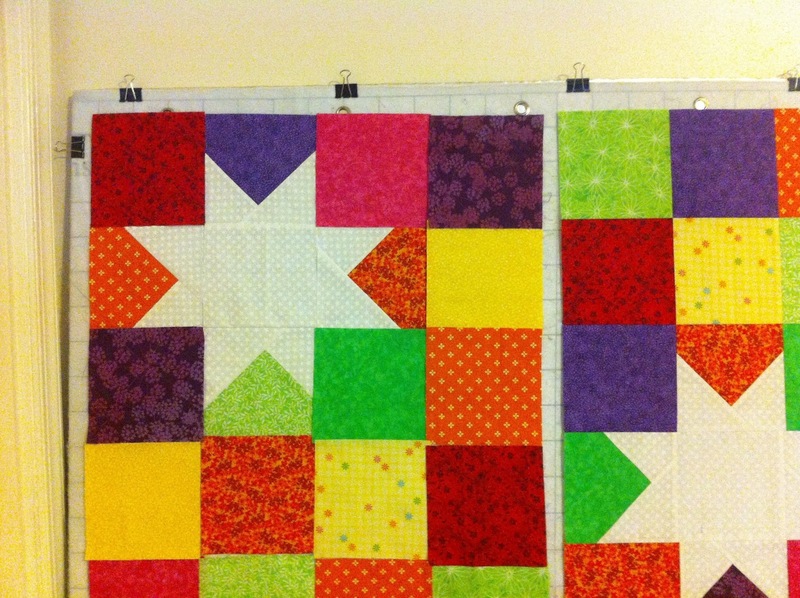 A dozen quilts already??? Paul is right. I am crazy, just plain crazy!!! Your posts always make me smile, Preeti :) Jewel Stars is a great name for a beautiful quilt! Congrats on finish #12. No, not crazy just creative and productive! 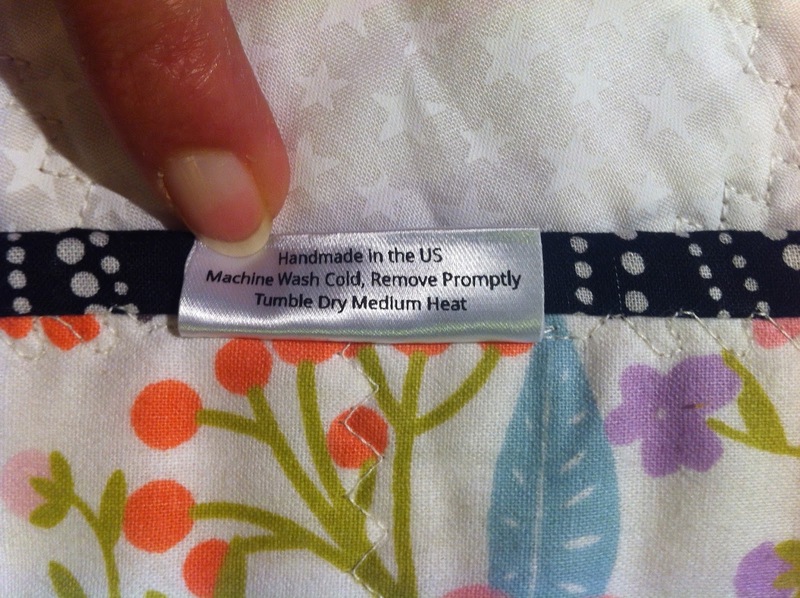 Love the label and that you put the washing instructions on the back - very ingenious!! Your stories always bring me joy. I love your quilt and think I will imitate it (highest form of flattery) because I am in need to a quick quilting pick-me-up. I have plenty of stash to make this one! I have to completely agree with you on every baby deserving a shower. I think we take for granted that those who choose to have more than one baby don't need anything or that we don't need to welcome a new baby as the glorious creature that he/she is. 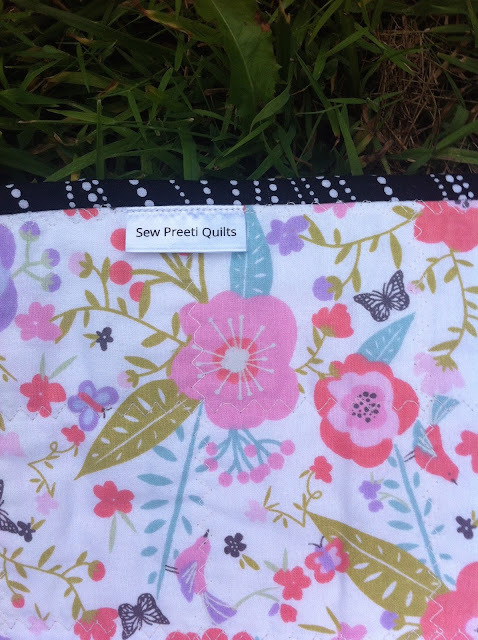 Thanks for your sweet thoughts and for sharing another Preeti quilt. That is an adorable quilt. How funny, the fifth baby gets a raindrop. Made me smile. Though it's true. I have four kids and really it is a treat to have some fresh things for each new baby. Great job! Your quilt is fabulous! It always feels special for me when I decide to do a random quilt just because and how quickly an occasion appears that the quilt is perfect for. Congrats on the 12 finishes, I am sure each one is as beautiful and as special as this one. Thank you for sharing and have a wonderful creative day! Perfectly timed quilt and I like the planned-random placement. I will keep this one in mind for a quick, bright finish for a child. Your narratives are so cute. And did you get a new hairdo? I like it! 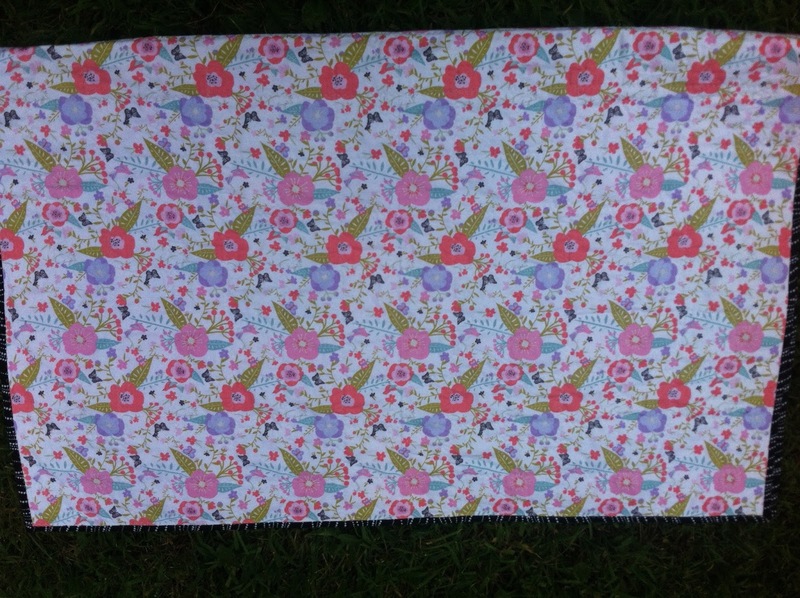 Such a darling quilt and a great choice for the binding. Love how the purpose came after the need to create. What a great story. 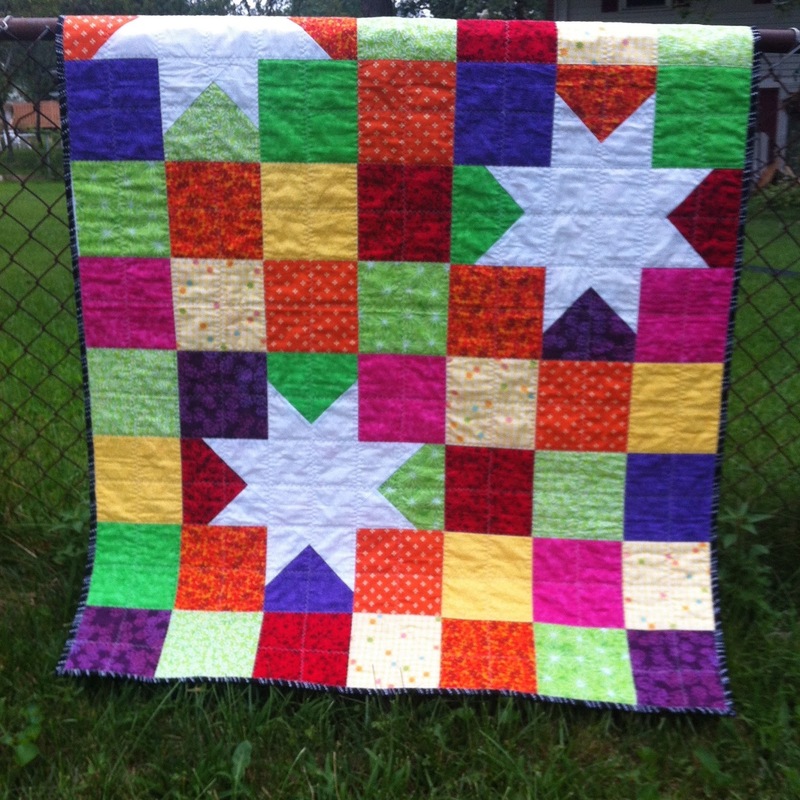 It's a fun and bright quilt, just right for a little one. Congrats on your 12th finish! 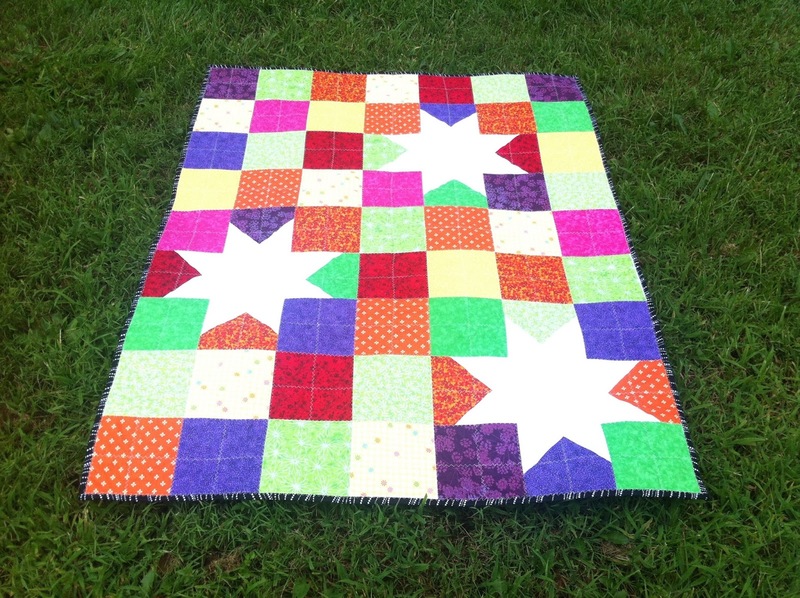 so you... the intuition to make a girl quilt.... the bright colors and 'planned random' stars. I actually love the concept and kind of want to make it too. Those stars are much nicer than sawtooth because the star fabric on the points comes further out than a true saw tooth. The look on her face is priceless. You have great timing! I bet when that little girl grows up she will love this, especially because it was hers first and not a hand-me-down. 14 finishes in six months though, that is a tiny bit mad! 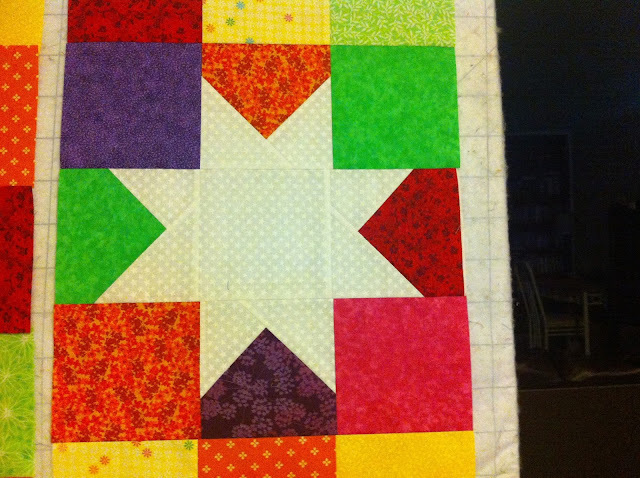 Love the stars in this quilt. Great job and a nice story. Thanks for sharing. 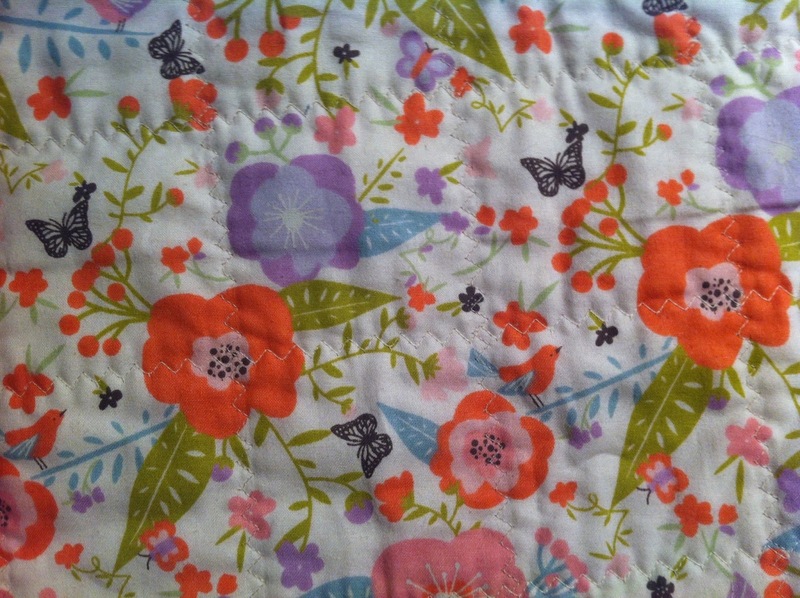 Lovely quilt and how wonderful it is for the yet to arrive baby - serendipity! When I had my first baby a mother with older children said to me the first baby get baby swimming, playgroups, baby yoga; the second gets baby swimming; the thirds gets the supermarket!! So I love your analogy of the raindrop. Your star quilt is adorable. I can see why you saved the pattern. It will bring lots of joy to a little one. The conversation with your husband made me laugh. I think they all think we are crazy! Congrats on the finish. What a great gift for the new baby to be. Wonderful quilt and how perfect that it found a new home right away! Love the bright colors! But the binding is really amazing! This is a great pattern, and I'm also putting it on my to-be-made list! I definitely understand your need to just make something. I feel that way so often! It's great that you found the perfect recipient for your quilt! Love your quilt! It is so simple but yet bright and attractive. Those stars pop out beautifully. I will definitely mark this for a good baby quilt! Love that the purpose of it was put right in front of you! How I conquered the Green Eyed Monster? I reserve all rights on my photos, tutorials, patterns, and blog posts. Simple theme. Powered by Blogger.